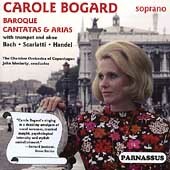 Baroque Cantatas and Arias restores to availability a selection of superb recordings by the soprano Carole Bogard. Originally issued on the Cambridge LP label, these recordings have never appeared on CD before. The new CD includes the contents of one entire LP and portions of two others for a generous program. Three of the items, two cantatas and one aria, also include the brilliant trumpet playing of trumpeter Armando Ghitalla, a long-time member of the Boston Symphony. Carole Bogard, who began singing in the San Francisco area, was noted during her career as a specialist in Baroque music. She performed regularly at such venues as Aston Magna and the Smithsonian. However, her repertoire also extended throughout the range of opera from Mozart to Strauss, and also into contemporary music and a wide range of art songs.